Chagatai Khan: How General (R) Mirza Aslam Beg violated article 6 of 1973 Constitution? How General (R) Mirza Aslam Beg violated article 6 of 1973 Constitution? The history of this much abused country is being churned to let the scum rise to the top. And what nuggets of filth are floating up -- military-made political parties, midnight jackals, cash for elections, Karachi operations, agency this and agency that. Is this the Pakistani version of a truth and reconciliation commission? The 'truth' being dished out has more slants than a right-angle triangle and it is certainly not leading to any reconciliation. The million-dollar question is where all these worms crawled out of? Have they rolled down the presidency, as the Pakistan Muslim League-Nawaz (PML-N) alleges or have they emerged from the irritable bowel of an over-active nine zero? The question of the month though is -- and it has been asked often enough -- let he who is without sin cast the first stone. I don't see a mad rush for the quarries and the reason is simple. The elite of this country has much to seek forgiveness for. We are all sinners literally and metaphorically. The politicians top the list because they flaunt their sins publicly or maybe we scrutinise them more fearlessly. They are vulnerable because their passion for fame and fortune makes them impatient. It is not a pleasure they want to defer and end up becoming easy targets for manipulators. The Hameed Guls and the Billas of this world thrive in this milieu. They have guns and cash. While the politicians are more visible, their sins in the larger scheme of things are relatively innocent. They make money and are unprincipled but their impact on the nation is more through happenstance than design. The sins of some people in the military have been more sinister, more egregious and more damaging to the nation. It is they who need to be exposed. In my reading of post-Zia history, there is no greater sinner than Aslam Beg. By his actions after Zia's death and indeed throughout his tenure of office, he caused great harm to this nation. He did not let democracy settle, manipulated parties and politicians and corrupted them, brought governments down, indeed did everything he possibly could to create circumstances for his ascent to power. He failed but in the process, he hurt us badly. It is easy to blame Ghulam Ishaq Khan (GIK) because he had his share of sins but without Aslam Beg goading him on, much of what GIK did would not have happened. It was Beg who asked Hameed Gul to form the Islami Jamhoori Ittehad (IJI) and stop Benazir and the Pakistan People's Party (PPP) from coming to power. When he could not stop it, it was he who led the media and dirty-tricks campaign to undermine it and bring it down. Let us keep our biases aside for a minute, ladies and gentlemen. Whether we like Benazir Bhutto is not the issue here and more importantly, let us suspend our knowledge of what she did later. However, in 1988 she was not only the most popular leader in Pakistan but an international celebrity. She was an Aung San Suu Kyi like figure whose father had been murdered and who had suffered much hardship. There was not a hint of the taints that later followed her. If Beg and his cohorts had been patriots, they would not have formed the IJI to stop her. Afterwards when she still made it to power, they would have seen her as an asset to Pakistan. They should have gone to her and said "Madam, you are inexperienced but we will help you run the government. Your international image is a great plus for the country and we want you to repair the damage to our global reputation after Zia's draconian dictatorship." They did nothing of the sort. They started to sully her image and taint her reputation from day one. She indeed had her faults and made their task easier but she should have been guided. 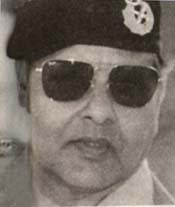 Instead, they launched operation midnight jackal, engineered a no-confidence move against her, got the MQM to take on the PPP in the streets of Karachi, thwarted the Pucca Qilla operation, which was leading to the capture of a huge cache arms stored by terrorists in Hyderabad, and then prevailed upon GIK to dismiss her government. This not only hurt Pakistan but derailed democracy. Had a single civilian government completed its tenure and transfer of power taken place through constitutionally scheduled elections, we would have been on our way. But Beg would not allow this. It was not without purpose. His plan was to first destroy the reputation of Benazir, bring her government down, and then do the same to Nawaz Sharif. Once all politicians had been damaged, he thought, his ascent to power would become easy. Consider this. After the Benazir government had been dismissed in 1990, he distributed money and did everything to make an IJI government come into power. Yet no sooner had Nawaz Sharif taken over, he was conspiring against him. I know this personally because I saw it happen before my eyes. Nawaz Sharif had taken over in perhaps October or November and by December, officers of military intelligence were making contact with the PPP to instigate it against the government. Not only that, Beg deliberately started to undermine Nawaz by taking a position different from that of the government during the First Gulf War. His agents, largely serving military officers but also some of his friends, principally one Lahore-based businessman, started to goad the PPP to take on the Nawaz Sharif government through street power. The purpose was to create enough trouble to make it possible for Beg to take over. Fortunately, for us, his time ran out and Ghulam Ishaq Khan trumped him by appointing a new army chief, two months before his term of office was to end. This was unprecedented and the only reason it was done was to make him a lame duck and thwart his ambition for power. Beg left with much regret but a legacy of bitterness was created that tainted the entire decade of the 90s. Democracy could not settle after that. Benazir and the PPP eventually managed to bring Nawaz Sharif down through Ghulam Ishaq Khan and PML N paid the compliment back by launching various movements during Benazir's second term in office. It then supported Farooq Leghari in the sacking of the second PPP government. This merry-go-round continued until Musharraf threw the whole lot out in 1999. End of democracy phase one. A new phase has started. What will this bring?